Pay a $200 Non-Refundable Deposit Now to Hold Your Seat. Balance of $350 must be paid before Sat, Sep 07. 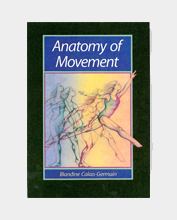 Anatomy of Movement is the suggested text for Power Pilates' Core Mat 1 training. Chapters 1, 2, 3 & 6 are most pertinent. This book presents a dynamic, integrated approach to the study of the physical structures of the musculoskeletal system. Includes shipping.